Chinese Manufacturers Warned about Infringing U.S. LED T8 Tube Light Patent_News_SiC Wafer,GaN Wafer,GaAs Wafer,Ge Wafer--XIAMEN POWERWAY ADVANCED MATERIAL CO.,LTD. A Xiamen-based Chinese technology company (厦门市钛科创科技有限公司) has alerted LED manufacturers of a U.S. LED T8 tube light patent that companies should avoid infringing on in its LED patent thread on social platform WeChat. Most Chinese LED T8 tube lights exported to U.S. are double-ended powered T8 tube lights. The technology company warned Chinese LED T8 tube light engineers of patent infringement issues using this type of power solutions. 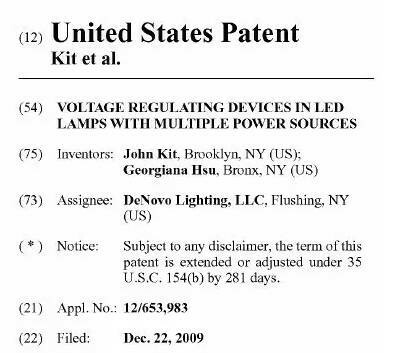 U.S.-based LED manufacturer DeNovo Lighting, for instance is starting to take legal action against U.S. retailers that are selling products infringing its LED power patent US8729809, a "Voltage regulating devices in LED lamps with multiple power sources." The company submitted its patent application on Dec. 12, 2009, and the United States Trademark and Patent Office (USTPO) granted the patent on May 20, 2014. The voltage regulating the devices can be a resistor in series with at least one Zener diode or a voltage regulator both in parallel to power the LEDs. The LEDs can also be arranged in anti-parallel diode pairs that make up one diode and one LED or two LEDs, or the LEDs can be arranged in anti-parallel diode string pairs consisting of diodes and LEDs or all LEDs. Based on the diagram, electricity enters from L and N areas seen on both sides of the graph, labelled 1, 2, 3 and 4. In the left pair 1 and 2 an IC driver is connected to at last one rectifier. Step-down transformers can be found in four areas respectively between 1 and 2, 1 and 4, 2 and 3, 3 and 4. The labelled 130 on the image represents the step-down transformer components. LED T8 tube lights are gaining traction on the market in terms of usage volume in commercial lighting applications, as many countries phase out less efficient light sources, such as incandescent bulbs. Layout of LED circuit design. If your LED T8 tube light design uses an isolated dual active bridge structure for the LED driver, this graph should seem familiar. For Chinese manufacturers that are exporting LED T8 tube lights, if your product is using this kind of design, you could potentially be infringing DeNovo Lighting’s LED patent. Companies should avoid potentially infringing this particular LED patent. If you are more interesting in GaN wafer,please visit our webstite: www.qualitymaterial.net or send us by email:sales@qualitymaterial.net.